(Nanowerk News) When it comes to studying single molecules, scientists use a powerful technique called “surface-enhanced Raman scattering” (SERS). An extremely sensitive tool, SERS detects the vibrations within the atoms of the illuminated molecule as a change in light color. But the sensitivity of SERS is limited at room temperature because molecules vibrate too weakly. Publishing in Nature Nanotechnology ("Molecular cavity optomechanics: a theory of plasmon-enhanced Raman scattering"), EPFL scientists now show that this obstacle can be overcome with the tools of cavity optomechanics - the interaction between light and mechanical objects. The work has significant practical applications, as it can push the capabilities of SERS even further. 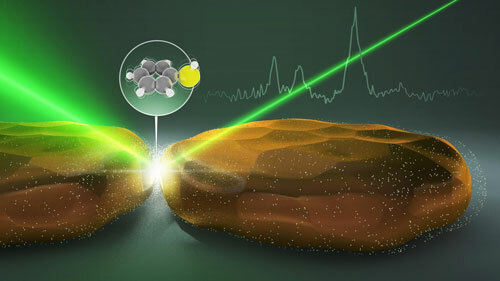 SERS is based on the principles of Raman spectroscopy, an old technique used to probe molecules: When laser light shines on them, it interacts with their vibrations (e.g. the stretching of a bond between two atoms). As a result, the wavelength of the light shifts, changing its color. This shift becomes the unique fingerprint of the type of molecule being probed. However, Raman spectroscopy is limited when it comes to single molecules because they interact very weakly with light. This happens mainly for two reasons: First, a single molecule is about a thousand times smaller than the wavelength of incoming light. Developed about forty years ago, SERS overcame this problem by exploiting a tiny cloud of oscillating electrons in metallic nanoparticles that were excited with laser light. The cloud is known as a “plasmon” and it can be localized to nanometer-size gaps where molecules can be placed. In other words, the metallic nanoparticles act as nano-antennas that focus light down to molecular dimensions; this approach enhanced the sensitivity of SERS by more than 10 orders of magnitude. However, the second limitation of Raman has persisted without solution: molecules vibrate very weakly at room temperature – or, in technical terms, “the relevant vibrational modes are frozen”. Two members of Tobias J. Kippenberg’s lab at EPFL have now found a theoretical solution to this problem, showing that SERS can actually be pushed even further in sensitivity and resolution. The key in overcoming the weak vibrations is the cloud of oscillating electrons, the plasmon, which can exert a force on the vibrations of the tested molecule. Researchers Philippe Roelli and Christophe Galland, were able to determine the exact conditions needed for this light-induced force to drive the molecule’s vibrations to large amplitudes. As the scientific community has set specific guidelines for this field, the researchers chose laser wavelengths and properties of the plasmonic structures against these. As the light-force amplifies the vibrations of the molecule, the interaction between the molecule and the confined laser light grows stronger as well. This can dramatically increase the signal that SERS picks up, well beyond what can be reached by previously known mechanisms. “Our work offers specific guidelines for designing more efficient metallic nanostructures and excitation schemes for SERS,” says Philippe Roelli. “It can push the limits of the technique in sensitivity and resolution.” By doing so, the study opens new research directions in the control of molecular vibrations with light, with potential applications ranging from biology and chemistry to quantum technologies.